The Guyana Watch medical team wrapped up its 19th mission Friday and according to President of Guyana Watch Inc, Tony Yassin, this year has been one of the better years for the mission. Friday saw the conclusion of the last clinic for 2011 which was held at the Leonora Primary School, West Coast Demerara. In giving an overview of this year’s visit Mr. Yassin said that the response from the public at large has been excellent. Thanks to his diligent team of medical doctors and volunteers they were more than able to meet the demands. Mr. Yassin said that the team attended to 2770 patients, 387 of whom had dental issues. According to Mr. Yassin the team did a job well done and the level of treatment provided will go a long way. Mr. Yassin also used the opportunity to express his heartfelt gratitude to the visiting teams, the people who turned up to make the visit a success, the people who helped make the team comfortable and the Ministry of Education for making the school buildings available for the clinics to be held. 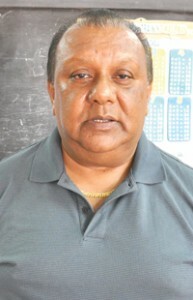 President of the Guyana Watch Inc, Tony Yassin. According to Mr. Yassin the team will be doing follow up work with ten persons who require treatment overseas. He added that he will be working along with hospitals overseas and with some of the doctors who were a part of the visit to ensure that these persons receive the treatment they need. The dental team which comprised two dentists, Dr. Apurva Dave and Dr. Chiran Reddy and their support staff was overwhelmed but, nevertheless, did their best. Dr. Apura Dave who said this was his first visit with the team, said that he will be looking forward to coming back if his services are required. Dr. Dave, who is originally from India but resides and works in the US, noted his visit here has been enlightening. However Dr. Dave believes that there is a lack of knowledge among the people about proper oral health.” He noted, too, that what was very alarming for him was the fact that there was a very high instance of tooth decay and cavity in toddlers. According to Dr. Dave persons also need to have regular checks with their dentists and practise proper oral health care. Similar sentiments were expressed by Dr. Chiran Reddy who has been working with the team for the past five years. Giving his overview of the team’s activities he too stressed the need for better oral health education among people. Like his colleague he too was shocked by the alarming cases of cavities and decays in toddlers. He said that he used the opportunity while meeting with the patients during the visit to educate them about the use of fluoride drop and tablets in their water as well as the importance of brushing their teeth. Dr. Reddy also stressed the need for parents to monitor their children when it comes to eating sweets and not brushing their teeth and most important, leaving children to fall asleep with feeding bottles in their mouths. For Dr. Reddy it is with a heavy heart that he is wrapping up with year’s visit as he feels there is so much more that needs to be done. If all goes well he will return next year to offer his services once again. Another doctor, this one specialized in Pediatric Care, Dr. Patty Vitale, has been with the team for three years. She said that this year’s experience has also been enlightening for her. According to Dr. Vitale her area of concern is over the fact that persons show little regard for preventative measures. Members of the Public waiting for services of the Guyana Watch Medical team yesterday at the Leonora Primary School. Dr. Vitale stressed that if people would visit the doctor for routine checkups then maybe there can be early detection and maybe lives can be saved. Dr. Vitale recounted that she was saddened by two cases; one being a three-month-old baby with a brain tumor that started at birth in his eye and now is too far gone. There was another child who developed a cataract after a motor vehicle accident. These two cases, Dr. Vitale said, would require treatment overseas and the Guyana Watch team will be looking into those matters. The Guyana Watch team with a total of 27 members arrived in Guyana on July 15 for its 19th mission. . The team consisted of 12 medical Doctors, two dentists, one pharmacist and 12 volunteers.